Live Music and Theater on the Byway! Local and national talent awaits you. From Hamlet to the Beach Boys, you'll find yourself pleasantly surprised. The idea for Big Top began in 1960 with 13-year-old co-founder Warren Nelson listening to the Kingston Trio sing stories of someone trapped on a train in Boston or a jail in Tijuana. Warren’s decision to become a songwriter opened a career path that would lead him and many others — including the Kingston Trio — to a canvas tent on Mt. Ashwabay in Bayfield, Wisconsin. 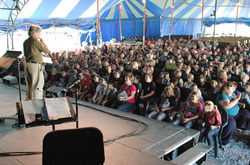 “Culture under the tent” enjoys a rich tradition in the Midwest. In 1874 the Chautauqua Assembly of Lake Chautauqua, New York, offered adult education in the sciences and the humanities. Soon after the turn of the century, traveling Chautauquas took the form of tent shows moving from town to town during the summer offering lectures and entertainment. The town of Bayfield hosted several Chautauquas during the years preceding World War I. A permanent Chautauqua landed in Bayfield in the summer of 1986 after the talents of Warren, his partner Betty Ferris and the Lost Nation String Band attracted the attention of community leaders in Bayfield, Ashland and Washburn. The group had received rave reviews for their original musical histories produced and performed for three specific occasions: Souvenir Views for the Washburn centennial celebration; Whistle Comin’ In for the Ashland centennial; and Riding The Wind for the Bayfield all-class reunion. Audience response to Riding The Wind – presented in the Bayfield High School gym — was so overwhelming that the group was asked to add an extra performance. Bayfield resident, Mary Rice along with the MAHADH Foundation (established by Mary Andersen Hulings and A.D. Hulings) offered to build a permanent theater that would showcase the myriad talents of these creative, experienced artists. 2013 marks our 28th summer season of facilitating the production and presentation of quality, affordably priced entertainment, suitable for the entire family. Through the commissioning of new productions, focusing on themes of regional historical and cultural significance, Lake Superior Big Top Chautauqua serves as a base of support offering artistic employment opportunities to local and regional artists and technicians.